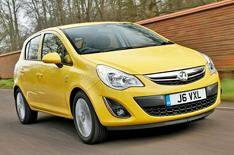 Vauxhall Corsa and Vauxhall Astra | What Car? The Corsas popularity in the UK is partly to do with its sharp styling. Mainly, though, buyers have a huge choice and the opportunity to bag a serious bargain. For out and out discounts, brokers are the places to go, but remember that will deny you access to Vauxhalls up to five years interest-free hire purchase offer, which includes a 750 finance deposit allowance. Its brilliant low running costs and a great basic spec with half-leather seats, Bluetooth and alloys. The gearchanges are flawless and its nippy for a 1.2, although it needs to be worked hard on the motorway. Im more than happy, and would recommend it. The Astras classy interior and smooth ride are what keeps it competitive in the crowded small family car segment, but its price is what really makes it a best seller. Our best deal is an online broker offer, but most dealers are able to offer good prices, too. These include the option of up to five years interest-free hire purchase and a 1000 finance deposit allowance. I bought the manual version, and although its not fast off the mark like my last Astra 1.8 SRi, comfort is excellent and its a Fuel-efficient, smooth runner. I also got a fixed dealer two-year service plan for 250, which is pretty good.